Carnation needs us – we need YOU!! 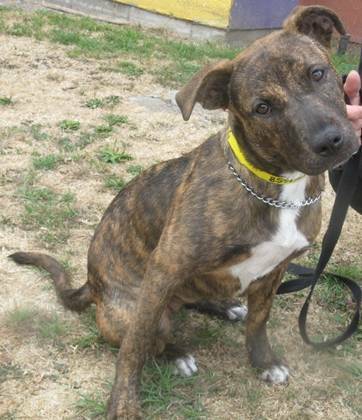 The first words I heard about Carnation (just a puppy at 7 months old, 33 pounds) were: “We can’t euthanize her. She is sitting in that cage playing with her toys!! !” What a doll this little brindle girl is! Sweet, loving with other dogs, just an angel who, unfortunately, will require a visit to an orthopedic vet to find out about her limp on the rear leg. FHO surgery is a possibility for her. But, we can raise funds if there is a rescue who will save her life. If medical staff is willing, we must support them!!! …the best I could do was take Carnation and walk her through [the treatment] room, with other dogs barking and growling at her. She did not react other than to go up, sniff, and wag her tail — and, in fact, backed away from a momma terrier with pups who was making it know that she was not wanted in that area! I asked a couple of the ACT’s who have spent time in medical and, without hesitation, everyone agreed that Carnation is sweet, polite, and non-reactive. They even said she was quiet in her cage — though I’m sure once healthy she will be romping about non-stop. We really, really, REALLY want to help this sweetheart! She looks so much like Fiona, it’s just eating us up inside – her deadline is FRIDAY, SEPT 28!! But we have NO ROOM. None. We’ve got people willing to help us raise the money for the possible leg surgery and physical therapy, but she needs a place to GO, i.e., a FOSTER HOME. Please, San Diego, we really, really need your help! Is there anyone who would be willing to open their heart and their home to this little angel? We will provide a crate, food, and cover all vet expenses. She just needs a place to stay either until space opens up elsewhere or until she’s adopted, whichever comes first. There have been NO OTHER RESCUES inquiring about this sweet girl, and she deserves a chance at a life! We NEED to save the breed ambassadors so they can go on to change the negative opinion of others about this remarkable breed. This girl sounds like an EXCELLENT ambassadog!! If you can help, please contact Kelly at pugglesnpitties@gmail.com. Time is of the essence, please contact us right away!! How do we donate directly to her?? Thanks for asking! We haven’t set up a chip-in yet for her but as soon as we do we’ll post it here and be sure to email you and let you know! what is the update on her? was her time extended and will you allow out of town foster??? We have found a foster. I am on my way to get her now! I am so glad a foster stepped up for Carnation. She is a real beauty. We have a brindle Dutch Sheperd as well as a mixed long-hair Chihuahua/pekanese (sp?)/poodle. The one is HUGE compared to the Chihuahua but they are great together. If I could take Carnation, I would. She is gorgeous. Thanks Barb, we’re pretty excited too!